Lauren and I sat through a great 30-minute Q&A with Spike Lee and cast (preceding the film), which was supremely helpful, if only because it contextualized what followed and made it endurable. BlacKkKlansman is sometimes hard to 'experience,' though, if for no other reason than because it's true, and oftentimes the truth is flat-out ugly and there's no sugarcoating it. 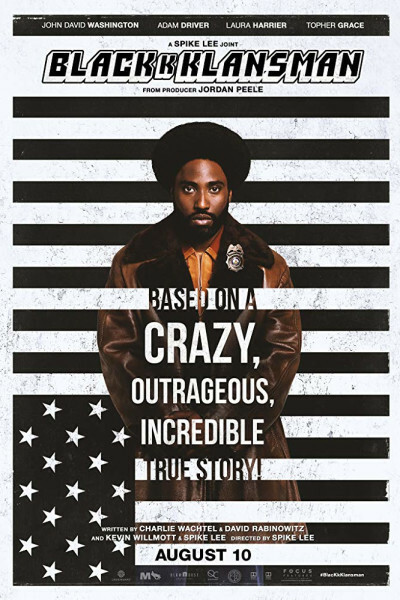 The final 10 minutes of BlacKkKlansman are especially powerful (and unsettling), including as they do the retelling of Jesse Washington's heinous public execution in 1913 (described by none other than 91-year-old Harry Belafonte), the death of Heather Heyer by white supremacist James Fields last August, and the Vanguard America rally in Charlottesville, VA that precipitated it. Truth be told, Lee could have made the film's ending a masterful documentary unto itself, had he chosen to do what Prince began with 2015's emotionally charged tribute, Baltimore, recounting as he did the deaths of Freddie Gray, Ferguson’s Michael Brown, and Rodney King 25 years before them. My imagination simply cannot comprehend the racial injustices perpetrated in the world, but Lee's message is as clear as it is timeless: "No justice, no peace." BlacKkKlansman's second scene features Civil Rights organizer Kwame Ture (formerly Stokely Carmichael, as portrayed here by Corey Hawkins) speaking at Colorado College in 1979 and quoting 5th century Jewish sage/scholar Hillel when he asks, "If I am not for myself who is for me? And being for my own self, what am 'I'? And if not now, when?" None of us can change the world, but everyone can improve his/her behavior in it, and that seems as right-minded a place to start as any.